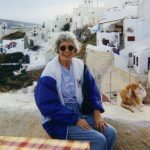 Today we have another great personal voyage report from Georgina Cruz, a freelance writer who has concluded 213 cruises to all seven continents including two voyages to New England/Canada and four World Cruises. Varied scenery; multiple ports to discover the culture and flavors of a region; sheltered waters (ideal for first-time cruisers); and the realization that although you are wandering, you are never far from land. 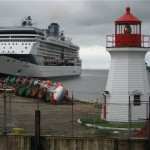 The pleasures of port-intensive coastal voyages are as clear as the coasts they hug! Our most recent coastal voyage was on Silversea Cruises’ Silver Whisper, a 28,258-ton, 382-guest all-suite vessel, on an 11-day cruise from New York to Montreal, visiting Canadian gems like Quebec City and Halifax, and hugging the East Coast of the U.S. from the Big Apple to Rockland, Maine with frequent stops (10 days in ports of call out of the 11-day voyage). The Cliff Walk trail, Newport, R.I. 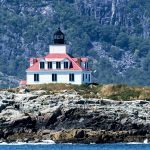 This is a must-see, with New England’s rocky coast and powerful surf on one side of the trail, and on the other, Newport’s “cottages,” the mansions of the rich and powerful. 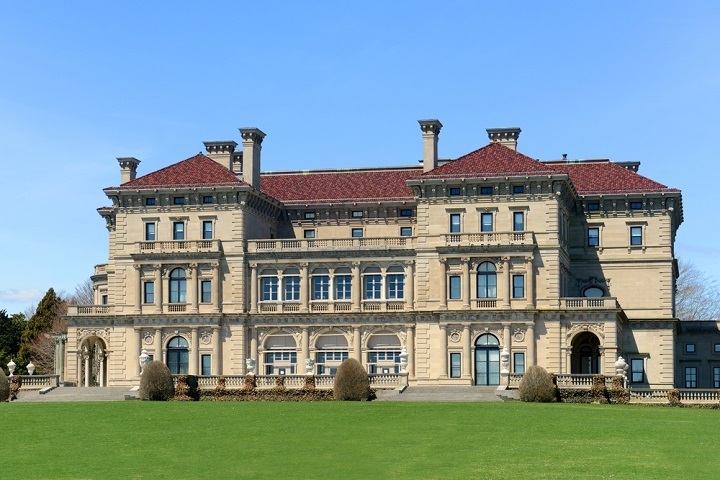 A self-guided tour inside the 70-room tycoon Cornelius Vanderbilt II’s The Breakers Gilded Age mansion, set on a 13-acre estate, showed us its Italian Renaissance interior with its opulent décor inspired on 16th century Italian palaces. This was like a walk back to colonial times and revolutionary history. A 2.5-mile trail marked by a red line on the city’s streets, it leads to historic churches, meeting houses, burying grounds, parks, a ship – the USS Constitution –and more. Among many highlights for us was the visit to Paul Revere’s House and the Old North Church of “one if by land, two if by sea” fame. Paul Revere’s House, dating from around 1680, is now a museum and the oldest structure remaining in downtown Boston. Revere and his family lived here when he made his famous ride to Lexington on April 18-19, 1775 that would be immortalized by Longfellow in his poem “Paul Revere’s Ride.” Other highlights included lively Quincy Market with countless food booths. 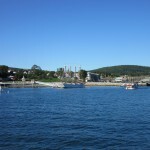 We passed by Rockport, one of Maine’s most beautiful harbors, before visiting the summit of Mount Battie in Camden Hills State Park for panoramic views of Penobscot Bay and Mountains, the quaint town of Camden and islands peppering the bay. It was a clear day, so we could see the distant Cadillac Mountain at Acadia National Park, the highest point along the northern Atlantic seaboard. 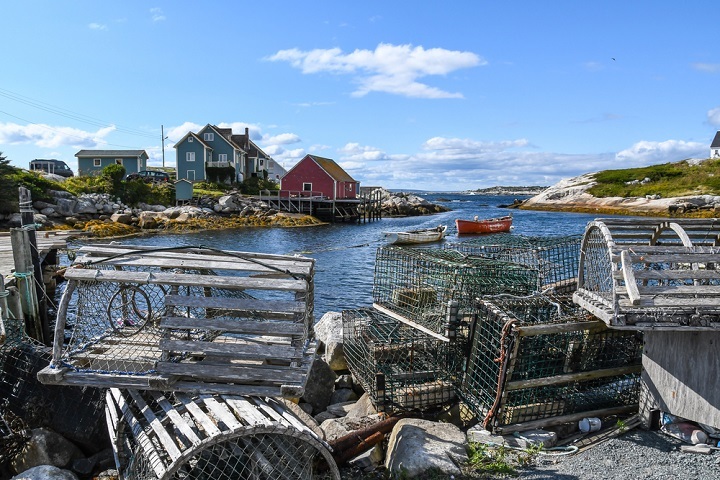 Our tour continued to Camden, a quintessential New England town nestled in a protected harbor between the sea and the rolling hills of coastal Maine. Free time allowed for browsing in the lovely shops of Camden and enjoying the fall colors. 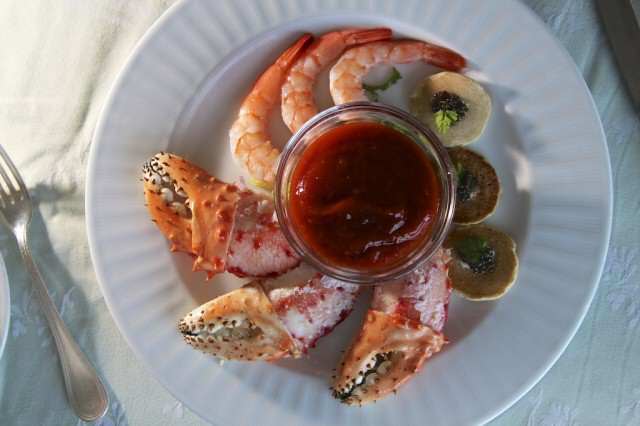 Then it was on to the Samoset Resort for a traditional ‘Downeast’ lobster bake in a beautiful setting along the coast. 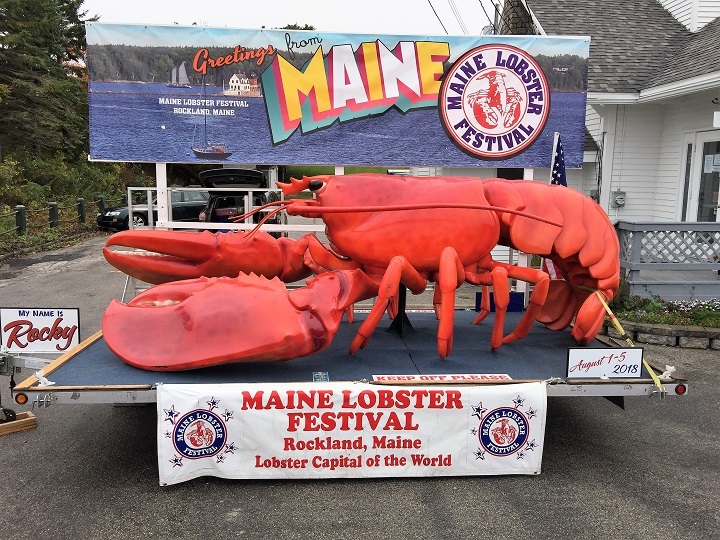 On the menu: a whole lobster pulled fresh from Maine’s ocean water and drizzled with butter, along with mussels, fresh bread, coleslaw, potato, sweet corn-on-the-cob, and a piece of homemade blueberry cake or pie for dessert. Yum! This is the only walled city in North America and a UNESCO World Heritage site since 1985. We took in the Place Royale with its stone buildings in the heart of town and North America’s oldest standing Catholic Church, Notre-Dame-des-Victoires. Other points of interest included the castle-like Chateau Frontenac and Le Quartier Petit Champlain, a pedestrian-only area with narrow cobblestone streets filled with outdoor cafes, boutiques and entertainers including strolling musicians, jugglers and other performers. The star-shaped Citadel Fortress, a National Historic Site of Canada in Halifax, Nova Scotia – This had been a highlight we had visited on a previous voyage. It dates from the mid-1700s, has an impressive 19th century Old Town Clock at its entrance, and it offers panoramic views of the city and its harbor. 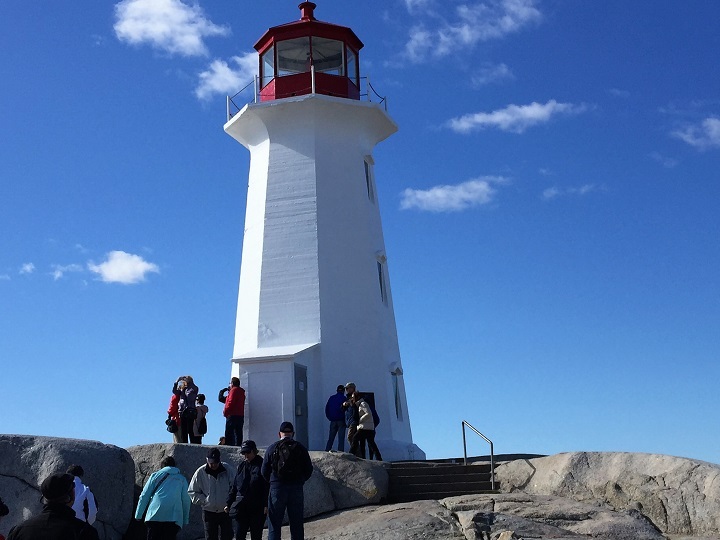 On this cruise, we opted for a tour to Peggy’s Cove, about an hour away from Halifax on St. Margaret Bay. 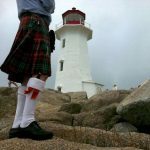 Peggy’s Cove is a picture-postcard-perfect fishing village with quaint buildings, lobster traps and the most photographed lighthouse in the Canadian Maritimes – a beauty in marshmallow-white and red colors that sits on a rocky promontory facing the sea. This offered a feast of fall colors with birches and willows resplendent in yellows. In the dramatic Saguenay Fjord with its 1,500-ft. high cliffs, other sights awaited: a pod of right whales and a 33-foot statue of Notre Dame du Saguenay with the Madonna perched on Cape Trinity. The “Ave Maria” was played in the outer decks of the Silver Whisper as the ship passed the statue of the Virgin Mary, in praise of the patroness of the fjord. The Silver Whisper is an ideal base from which to explore the coasts and ports of a region with her elegantly-understated, contemporary décor, relaxed ambiance and attentive service with a crew to guest ratio of 1 to 1.3. In addition to the aforementioned dining venues of La Terrazza and Hot Rocks Grill, the ship features The Restaurant, the main dining room, with international specialties; La Dame, an alternative, intimate restaurant for 24 diners, featuring gourmet specialties inspired in the upscale boutique hotel and restaurant guild of Relais & Chateaux (fee is $60 per person, the only restaurant that charges a fee onboard); and complimentary 24-hour room service. 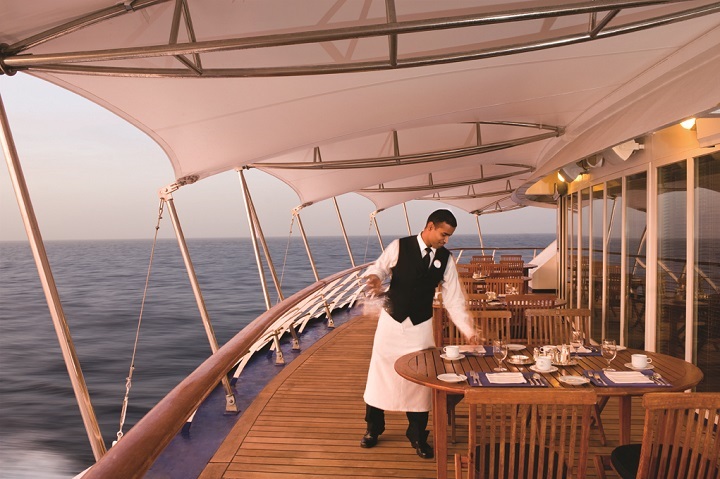 Our butler – each suite has a dedicated butler—served us dinner in our suite course by course on one occasion, when we preferred to dine in our accommodations after a long day of touring ashore. One of our favorite restaurants for lunch onboard was La Terrazza where it was a pleasure to munch on antipasti including Parma ham and Parmesano Reggiano cheese in the outdoors section being fanned by fresh breezes. La Terrazza, the signature Italian restaurant reflecting the ship’s heritage, and its delectable fare came with a side of views of the Boston skyline on one occasion. Needless to say we lingered over a sinful homemade chocolate gelato. On yet other occasions, we toasted the lighthouses of the New England coast and Canada, while delighting in scrumptious slices of pizza Margherita –a symphony of buffalo mozzarella, tomatoes and basil cooked in a stone oven at the outdoor restaurant. In addition to dining, another area where the Silver Whisper shines is in her accommodations. The ship has 194 ocean-view suites ranging from entry level accommodations measuring 287 square feet to spacious apartment-style lodgings measuring 1,435 square feet. More than 80 percent of the accommodations have private verandas. Suite amenities include butler service, bar set-up and replenishment, convertible twin-to-queen beds, Pratesi bed linens, walk-in wardrobe, sitting area with writing desk, dressing table with hair dryer, choice of pillows, plush robes and slippers, Italian marble bathroom with telephone, choice of Ferragamo, Bvlgari or SebaMed, hypoallergenic bath amenities, double-basin vanity, full bath and separate shower, refrigerator and cocktail bar, remote controlled flat screen television with DVD and satellite reception, direct-dial telephone, Wi-Fi and cellular service, personal safe, and 110/220 electric current. Owner’s, Grand and Royal Suites feature whirlpool bathtub, guest powder room, CD player & espresso machine. 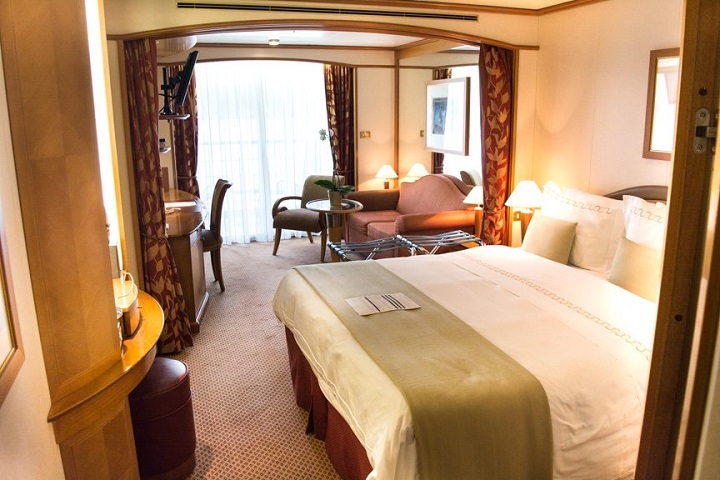 When we could tear ourselves away from our suite, the ship’s public spaces beckoned. Among our favorites were the Observation Lounge, a relaxing venue with views and books, ideal to watch port entrances and departures from, and the Viennese Lounge, where full-scale productions and variety entertainment and films are presented in the evenings. One of our favorite shows was a presentation by cruise director Vicki Van Tassel featuring song, dance and humor and chronicling her journey to Broadway. What can I say? We hope to do it again soon –the coast is clear, after all!